Kaleidoscope Heart is the third studio album by American singer-songwriter Sara Bareilles, which was released on September 7, 2010. The album debuted at number one on the Billboard 200, selling 90,000 copies in its first week. Bareilles stated on her website the reason behind the album's title, "I picked out the name of the record months before I even finished writing the songs. I love the imagery of those words, and they’re really representative of how I envision my heart. It's a colorful but fragmented, ever-changing sum of all the bits and pieces that make it up. A kaleidoscope is the tool that helps make sense of the mess. Or at least makes it nice to look at." She also stated she suffered from "writer's block" after her second album, Little Voice; however, upon writing the song "Uncharted", she drew inspiration from this song to write the rest of the record. The title of the album, "Kaleidoscope Heart" was chosen by Bareilles from the lyric in the bridge of "Uncharted". On May 12 (Canada) and May 14 (USA), during the fourth-season finale of Brothers & Sisters, a new song from Bareilles was played during a scene of the show. It was confirmed by www.abc.com that the song is called "Uncharted". On June 1, the track list and release date were released online. Three promotional singles and the entire album were made available before the release of the album. On August 23, 2010, the track "Hold My Heart" was released exclusively for streaming on Whole Foods' website. On August 25, 2010 the track "Uncharted" was released exclusively for streaming on the Entertainment Weekly website. On August 27, 2010, the track "Gonna Get Over You" was released exclusively for streaming on Barnes & Noble's website. On August 31, 2010, the full album was made available for stream on www.iheartradio.com. She performed "King of Anything" on The Tonight Show with Jay Leno on September 3, 2010, as well as on Regis & Kelly and The Today Show on September 7, 2010. On September 21, 2010, Bareilles performed on The Late Late Show with Craig Ferguson. "King of Anything" was the lead single of the album. It was released on radio in the United States on May 10, 2010, and went on sale in June 2010. It peaked at #32 on the Billboard 100, becoming her second top 40 hit on the chart (after "Love Song" became her first). In the Netherlands it fared even better, reaching #21. The second single from the album was "Uncharted", and was released to radio in the United States in January 2011. It peaked at #13 on Billboard's Adult Pop Songs and #16 on the Bubbling Under Hot 100 chart. The third and final single was "Gonna Get Over You", with a music video directed by Jonah Hill. It was added to the Hot AC on September 19, 2011. The song debuted on Billboard's Adult Pop Songs at #39 eventually climbing to #35. The music video was released on YouTube at September 22, 2011. Kaleidoscope Heart received a 68% on Metacritic, resulting from generally favorable reviews. Stephen Thomas Erlewine from AllMusic rated the album with 4 stars out of 5 and has claimed positively that "Despite lushly detailed arrangements, Bareilles never pushes this distinctly commercial gift too hard, letting the songs flow easily and this gentleness is almost as appealing as those classically constructed melodies, tunes so softly insistent they could conceivably appear on adult contemporary charts anytime from 1971 to 2010". Jon Pareles from The New York Times was also positive regarding the album, saying that "When Ms. Bareilles goes for more straightforward tugs on the heartstrings, she often sounds like Sarah McLachlan's gifted apprentice, complete with Ms. McLachlan's trademark of going breathy at the top of a phrase". Ann Powers from Los Angeles Times claimed that "The singer-songwriter's background in university show choirs serves her well here, as she finds strength in complex vocal arrangements and the sorts of dramatic set-ups that have reminded us, through Fox's popular television show, that the very act of raising our voices can be a hugely liberating act". Mikael Wood from Entertainment Weekly was favorable, saying that "On Kaleidoscope Heart, sometimes, as in the airless Breathe Again, all that earnest yearning can make you feel like you've been sentenced to life at Lilith Fair". Will Hermes from Rolling Stone gave a rating of 2.5 stars (out of 5) and a mixed review, analysing that "Bareilles veers between fellow pianists Alicia Keys and Regina Spektor, avoiding either's extremes". Another mixed review, came from Enio Chiola from PopMatters, who claimed that "Although Kaleidoscope Heart was probably intended to prove Bareilles' staying power, it only confirms suspicions that in some years, she'll be as remembered as Michelle Branch, or Tracy Bonham, still making music, but without any of the mass appeal they once enjoyed". On the Billboard 200, Bareilles scored her first number-one album and her best sales week ever. Kaleidoscope Heart topped the chart with 90,000 copies sold, according to Nielsen SoundScan. As of July 2013, it has sold over 441,000 copies in the United States. All tracks written by Bareilles, except where noted. ^ Bareilles, Sara (2010). "Sara Bareilles: King of Anythingalifianakis > Biography". Facebook note. Retrieved May 10, 2010. ^ notícias. "Nos EUA: Sara Bareilles estreia em primeiro lugar na lista dos álbuns mais vendidos da semana | Confira os 10 álbuns mais vendidos entre os dias 07 e 14 de setembro". Popline.mtv.uol.com.br. Archived from the original on 2012-03-02. Retrieved 2012-02-26. ^ "Sara Bareilles Names Her New Album 'Kaleidoscope Heart'". popdirt.com. 2010-06-02. Retrieved 2010-09-14. ^ "Sara Bareilles - "Uncharted" at the Roof Top Pool". YouTube. Retrieved 2010-09-14. ^ "Brothers & Sisters - Music Lounge". ABC. ^ "®R&R :: Going For Adds™ :: Hot AC". Gfa.radioandrecords.com. 2011-09-19. Archived from the original on 2012-03-31. Retrieved 2012-02-26. ^ "Music - NY Daily News". 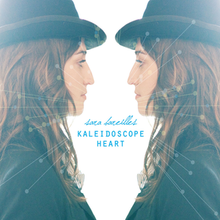 ^ "Album review: Sara Bareilles, 'Kaleidoscope Heart'". 7 September 2010. ^ "New CDs". The New York Times. 6 September 2010. ^ "Sara Bareilles: Kaleidoscope Heart". ^ "Sara Bareilles - Kaleidoscope Heart (album review ) - Sputnikmusic". ^ "Washington Post: Breaking News, World, US, DC News & Analysis". ^ "Critic Reviews for Kaleidoscope Heart at Metacritic". Metacritic.com. 2011-02-07. Retrieved 2012-02-26. ^ "Critics' Choice - CDs from Sara Bareilles, Vijay Iyer and the Steeldrivers - NYTimes.com". NYTimes.com. 2010-09-05. Retrieved 2012-05-22. ^ "Album review: Sara Bareilles, 'Kaleidoscope Heart'". latimes.com. 2010-09-07. Retrieved 2012-05-22. ^ "Kaleidoscope Heart Review". EW. 2010-09-01. Retrieved 2012-05-22. ^ "Kaleidoscope Heart". Rolling Stone. 2010-09-07. Retrieved 2012-05-22. ^ "Sara Bareilles: Kaleidoscope Heart". PopMatters. 2010-09-09. Retrieved 2012-05-22. ^ "Sara Bareilles' Blessed Unrest: Inside Her Personal & Professional Changes For New Album". Billboard.com. 2013-06-24. Retrieved 2013-07-11. ^ "Sara Bareilles Music News & Info". Billboard.com. Retrieved 2012-02-26. ^ Steffen Hung (2011-02-27). "Die Offizielle Schweizer Hitparade und Music Community". Hitparade.ch. Retrieved 2012-02-26. ^ "Chart Log UK: New Entries Update". Retrieved June 19, 2012. ^ Caulfield, Keith (2010-09-15). "Sara Bareilles' 'Heart' Beats at No. 1 on Billboard 200". Billboard. Retrieved 2010-09-15. ^ "Best of 2010 - Billboard Top 200". Billboard. Nielsen Business Media, Inc. Retrieved 2010-12-31.